Although most people believe that there is little we can do to improve the intelligence we were born with, the brain can be exercised just like any other part of the body. Thought processes and intelligence scoring can be improved by practising different types of testing. 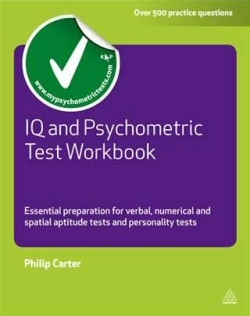 This title from IQ expert Philip Carter is a companion volume to the bestselilng "IQ and Psychometric Tests", and it includes not only hundreds of practice questions, but also answers but explanations. The broader format allows space for writing answers and making notes, and readers are provided with feedback so that they can assess their own strengths and weaknesses. Topics covered include: verbal aptitude tests, numerical aptitude tests, visual aptitude tests, problem solving tests, personality questionnairesm and advice on adopting the right approach to psychometric testing. "The IQ and Psychometric Test Workbook" provides an ideal opportunity for anyone to improve their IQ rating, or individual performance at psychometric tests, through continual practice and self-assessment.